With goals to being a pioneer in the rap game, Wesley(c dot smoka)Hayden has seen his share of up's and downs not only with music business, but with everyday life as well. Which explains his strong ambition and determination, growing up in Garland TX,(suburb of Dallas), c dot grew up around an older crowd in the city which exposed him to life in a way he says made him become a man at a young age. He was a real big fan of no limit records in the mid 90's and admire the hustle of Master P. He started writing rhymes at the age of 12, which is when he learn the art of 16 bars and 4&8 part hooks. His big brother J.R., was a huge part of his life as far as everyday living and music. It took a toll on him when he got locked up for 8 years. C Dot had to learn a lot about life without him. As life went on, c dot continued with the growing of his life as well as his music, graduating high school in 03' going to college for two years and making music as well, being involved in local talent shows and being featured on mix tapes in the city where he went to college. C Dot progressed in his love for music and since then he has done numerous shows all over the southern region, released multiple mix tapes, which include the latest releases Uncle Willies Son, which was dedicated to the loss of his father late 2011, and the 2nd recently released collaboration album with label mate Chill Will Da Don entitled Latenite Muzik: The EP. Since the release of Uncle Willies Son, C Dot Smoka has taken a step back to assist with the management and promotions of label mate Chill Will. C Dot Smoka was featured on Chill Will’s The Saga Continues and on his newest release Power Moves Only. 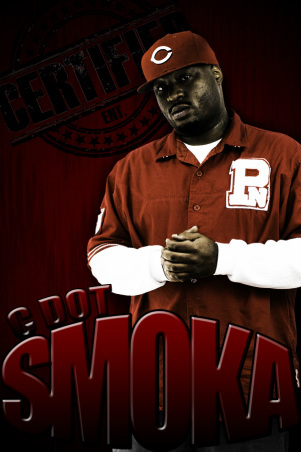 C Dot Smoka is currently working on his next project but is keeping it under wraps until its time to announce it. So stay tuned. Listening Party featuring Exclusive tracks from Uncle Willie's Son!!! July 24th interview with Ms. Blaquerose in Atlanta! Purchase these songs on iTunes NOW!! !